HSINCHU, Taiwan, Nov. 1, 2018 /PRNewswire/ Richtek, the global leading analog IC design company has brought its innovative power management solutions to automotive applications. 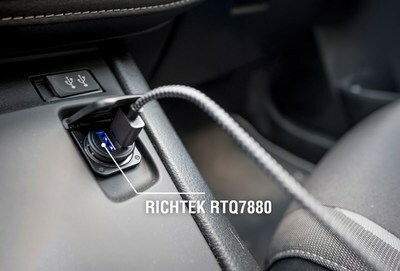 Richtek has launched RTQ7880, the world's first integrated IC device that combines USB Type-C Power Delivery and a Buck-Boost controller, making it a true one-chip solution for the new generation 100 watts (20V/5A) high power car chargers. The AEC-Q100 grade-2 qualified RTQ7880 is ready to fulfil the requirements of current and future car chargers. Richtek, being a member of USB Implementers Forum, has designed the RTQ7880 with a high level of flexibility. The built-in ARM MCU and fully programmable PWM block enable a special AnyPower functionality, which meets the latest USB PD 3.0 with Programmable Power Supply requirements. Furthermore, RTQ7880 includes comprehensive protection functionality which are all hardware-controlled, making the system truly PDSafe. For charging systems that need to support non-USB-C legacy devices, the RTQ7880 includes USB data-line sensing circuits for detecting BC1.2, QC2.0 and QC3.0 and Apple mode systems. The RTQ7880 MTP memory firmware can be updated via the USB port.